Last year, with input from students, I wrote a mystery one of whose central features is a small, sealed box that the protagonist finds and seeks to open. The desire to know what’s in the box plays a key role in propelling the reader through the story. 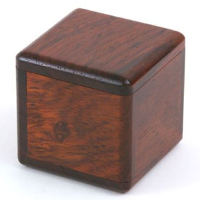 When I was an English teacher at Hiroshima International School, I found a fancy green box with a velvet interior and I christened it “The Magic Box.” Then every day, before each class, I would hide something in it. This activity quickly caught on with my students and they would rush into my room and pepper me with questions and guesses in English, their second language, as I offered hints. Finally, after taking full advantage of this exchange to elicit language from them, I would open “The Magic Box” and produce the secret object. Why not try this and see what happens? It takes up very little time and adds a powerful layer of class culture. -Indirect speech: Ginny bets that a slow loris is in the box. What do you think is in the box? -Tenses: What was in the box yesterday? What do you think the box will contain tomorrow? -Comparatives and superlatives: What’s the craziest (biggest, smallest, most expensive, worst smelling, etc.) thing that has ever been in the box? Is today’s item bigger (smaller, prettier, etc.) than yesterday’s? -Conditionals: If you guess correctly what’s in the box, then I will sing “Shake It Off” backward in the language of your choice. Posted in Lesson Plans, Teaching and tagged #indwelli, habits, joy, language, lesson plans, low prep, school, success, teaching, whatever works. Looking for a post or page? Cut Yourself Some Slack. Actually, Tons of Slack.